Okay, so how did this get by us for so long? Known variously as the Clarke Peace Memorial Fountain, Clarke Memorial Fountain, War Memorial Fountain and Notre Dame’s Stonehenge, this may be the only Stonehenge-referenced sculpture on the campus of a Roman Catholic university. It consists of four huge trilithons and five fountains, one for each trilithon and one rising from the sphere at the center of the monument. The taker of the photos toward the bottom of this post, a man we know only as John and by his Flickr name, Imazing, tells us, “This center fountain crashes down onto the sphere, creating a beautiful effect, especially during the night time when it is lit up.” You can see it here. Amazing photo! The proportions of the trilithons echo the architecture of the Theodore M. Hesburgh Library which stands behind it, as you can see in the same picture. As an interesting aside, another side of the library , seen on the left, displays a huge mural that depicts Jesus, the central figure in Christianity, teaching. 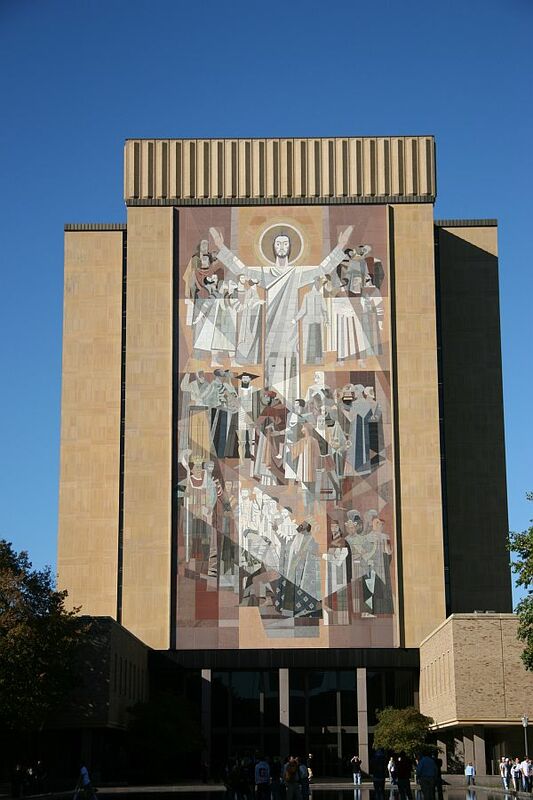 Around Notre Dame, a school known for its American football team, this mural is affectionately known as Touchdown Jesus because his arms are in the position used by referees to signal a successful goal, or “touchdown” in American football. Okay, yes, as you point out, you pedant, surely they mean megalithic rather than monolithic here. But it does show that the sculptors did have Stonehenge in mind, not the case, we’re told, about the campus sculpture commonly called Stonehenge at the University of California at San Diego. We must say it does have a nice looming effect. We like it much more than the Rolla Stonehenge at the Missouri University of Science and Technology in Rolla, Missouri. That one is more functional, though, while this is just, well, art. There’s something very robotic about that Rolla unit. We found this Stonehenge, by the way, while browsing the Stonehenge page of a website on Peace Monuments Around the World. Thanks to them for that and for linking to us! There is more information and many more pictures of this monument on the Historical Marker Database. As for score: 6½ druids, which is what we gave to Rolla. We’re pleased to be adding another campus Stonehenge, another Stonehenge fountain and another to our list of Large Permanent Replicas, all at once! Who knows what further henging delights may be lurking out there? Hope you’re enjoying the summer, or winter if you’re in the–heh–lower hemisphere! 😉 Happy henging! Third photo by Imazing, used with permission. Touchdown Jesus photo is in the public domain.